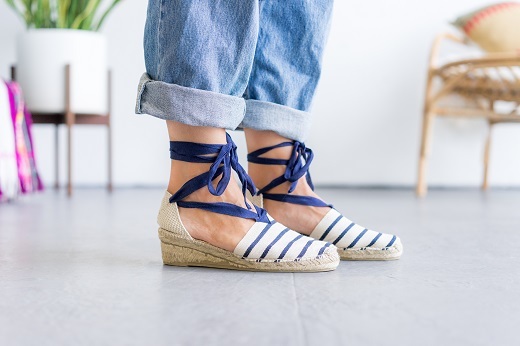 The Mediterranean in Blue Stripes, with a traditional wedge and cotton ribbon ankle lacing, is a go-to style to compliment jeans, skirts, sun dresses - you name it! The wedge height is slightly lower than our Ankle Strap Wedge (about 2 inches) and are complimented with ankle laces. All of our Laro espadrilles are handmade in Spain and are equipped with vulcanized rubber soles. This style runs a bit small. Most of our half-size wearing customers find success choosing the larger of the two sizes they are in between. We recommend comparing your foot measurement with our sizing chart to make the best choice.